After a trip to a local Asian grocery we came home with loads of goodies, including a red curry paste and fried tofu, which I decided were meant for each other. We also got some Japanese Mochi, which I haven’t had for years – yum! 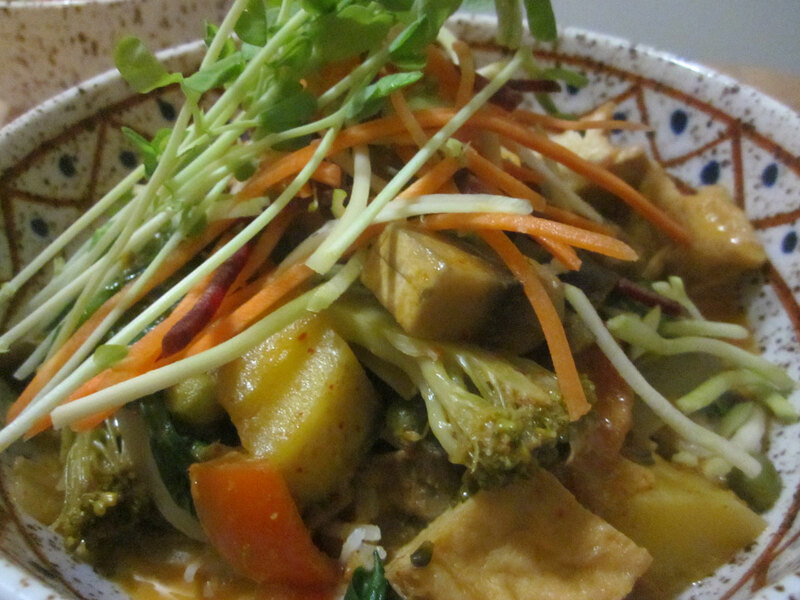 I haven’t had a red curry for ages, and was pretty keen to make this. So last night I decided to put them together. The veggies I used were pumpkin, eggplant, capsicum, mushroom, broccoli, peas, carrot, onion, baby spinach and rocket. The rocket may seem an odd inclusion, but I’d forgotten to get any Asian greens, and I had a mix of baby spinach and rocket which needed to be used up, and it works! So first up I cubed the pumpkin and chopped up the eggplant, mushrooms, capsicum, broccoli, and sliced the carrot and onion. I put the wok on to heat up and put in some peanut oil. The first things I added were the onion, pumpkin, carrot and eggplant (I like eggplant well cooked and mushy) and cooked them for a few minutes until the onion was softening. Then I added the curry paste and 1 can of coconut milk and brought it to the boil. Once it was boiling I turned down the hot plate, added the tofu (so it could soak up lots of flavour), and let it simmer until the pumpkin was mostly cooked. Then I added the mushrooms, broccoli and a can of coconut cream. Yep, 1 can of coconut milk and 1 can of coconut cream. The recipe on the paste actually called for 2 cans of coconut milk, but I like it a bit thicker and creamier. I put on the lid and waited. Once it was simmering I added the peas, put the lid back on and turned off the hot plate. Then we took the dogs for their evening walk, and when we got back everything was cooked. 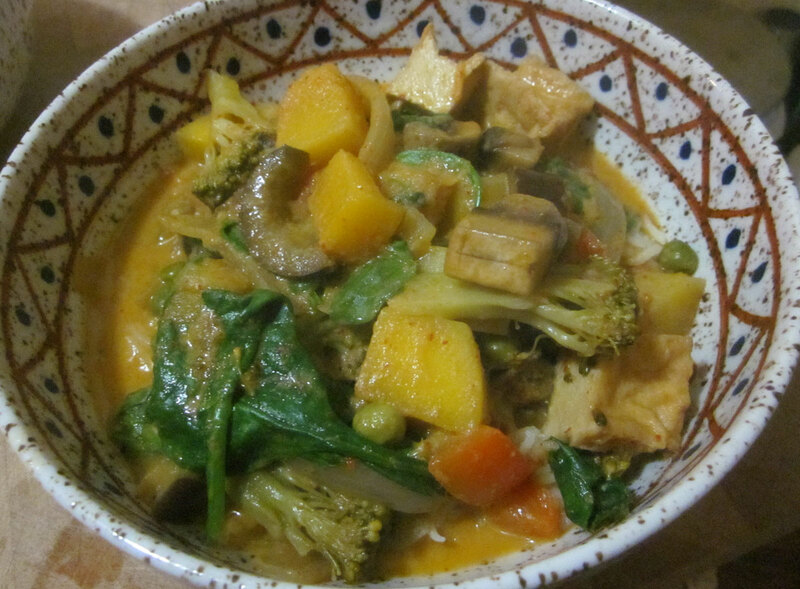 When it was time for dinner, I put some rice on, and while that was cooking I slowly reheated the curry. Just before it was ready I added the spinach and rocket and stirred it through. To serve I put rice in the bottom of a bowl, poured curry over that, and then topped it with some raw julienned carrot, celery and beetroot plus a handful of sprouts. I have to say this really, really hit the spot!